Excuse me for cross-pollinating both of my blogs purely for my own self promotional purposes. I’ve been compiling notes, writing, illustrating and researching towards the completion of my book by December 28th, 2012: “Adora & Vitali: A Spin on the Matter of Motion” (Love and Life !-) The deadline imposed by the crowd funding platform Kickstarter, is over, and frankly I’m happy to have had this outside source of motivation! It’s a tale about a quest, with a lot of physics laced into it. I created this promotional video to inform and update potential investors about the nature of my book and progress I’ve been making. Kickstarter is a crowd funding platform. The book is a science fantasy, laced with a lot of scientific facts, for which I have an extensive bibliography. The tale is a spiritual quest, in terms of finding appreciation and awe in all of life. 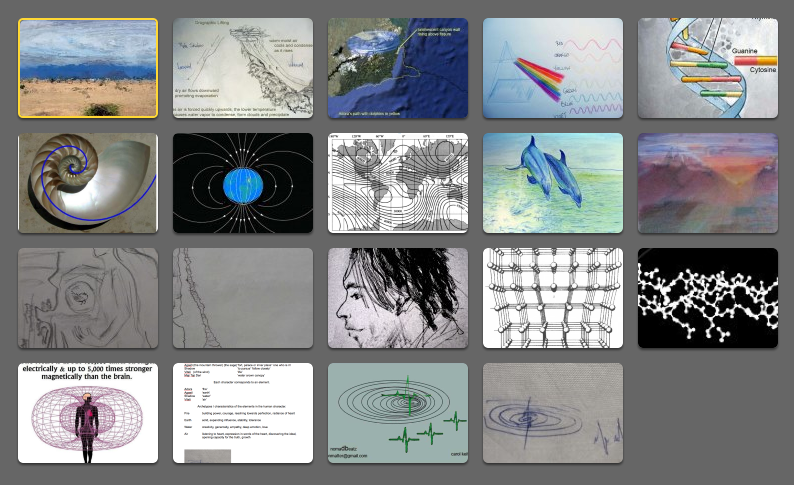 It introduces various scientific concepts; involving some geology, chemistry, biology and particularly physics. My incentive in delineating these topics is not only to lay the foundation of how the characters will proceed in their journey, but also to entice readers from 12 years of age and up, to be intrigued with science and instigated to further investigate the topics. I introduce among other things, the fact that much of matter is composed of waves, that the most efficient design in nature is the spiral (which Adora learned from someone in a dream who indicated this by pointing to the tail of a seahorse), the fact that many things in nature are spinning, from the macro to micro environments and an introduction to electromagnetism. This is all relevant, because Adora needs to follow the earth’s magnetic lines in order to reach the entry point to this other world, and a dolphin which navigates through magnetoreception, will guide her. In order to contribute to this book and to look at what rewards are there for you, follow this kickstarter link specifically to my book project. Thanks!